This 100 year old farmhouse has been painstakingly renovated and converted into two charming and modern holiday houses. The 'main house' is the former barn with an authentic 'peasant' character because of the use of oak and stone. The front house (rented out seperately) is the original home of the farmer's family. Here you can enjoy relaxing on the large lounge sofa or on the luxury terrace, complete with a BBQ of course. Open a bottle of Crémant de Bourgogne and enjoy the full unobstructed view while the kids have fun on the trampoline, swings or playing table tennis in the large garden. A small road runs from the house to the water mill (1km). Here, there is a small river where you can enjoy swimming. In the charming village of Luzy (15km) there are shops, including a supermarket, bakery and restaurants. Are you a real nature lover? 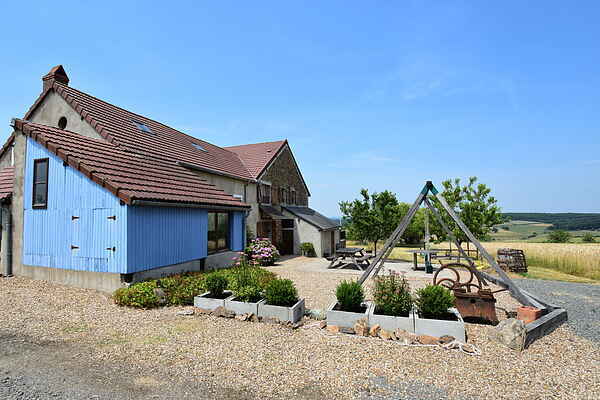 With an open location surrounded by hills, this property is ideal for hikers and cyclists with the Parc Régional du Morvan as the highlight. The pretty medieval town of Autun with its lively center and indoor market in Nevers (60km), offers a more cultural experience. Visit the many markets in one of the numerous surrounding villages and find out why this area is considered one of the most beautiful wine regions of France.